Sleigh Beds Ring ......are you listening? It arrived as foretold, on Friday morning. Funny, when the mattress & base came 3 weeks ago we had about a foot of new snow. This day, 84F...around 30C....still can't get my head around it. Anyway, it came and it is brill. I put the covers on it immediately and also immediately it was claimed by Tootsie. So, she is in the picture. It is very comfy and high. I like high beds. You have to be careful not to fall out though. It is a long drop. I almost didn't sleep in it last night. Poor Philip had snorey poops big time. After a few prods and shakes, it became obvious he wasn't giving up so I took myself off to a spare bed. I was not at all gruntled. I was very 'disgruntled' as I wanted to sleep on my posh new mattress but it didn't seem like I would get any sleep with Philip rattling the windows. After a while I found I needed to get up for a wee. As I passed our bedroom, the one with the posh new bed and mattress, I noticed .........nothing. No rumblings, no snorts and no grunts. I waited for a bit..........silence. So, I took a chance and ventured back into the new bed. I fully expected him to spring back to life and explode into a barrage of roaring thunder, boom, boom, boom, as soon as I settled down. But no.......no launch of cannon fire. I could sleep !!! "To sleep, perchance to dream" - unfortunately it was to dream........to dream of enormous spiders that invaded my house. Not only did they invade but they laid eggs which hatched into thousands of baby spiders which were everywhere. There were spiders' webs everywhere, which caught in my hair and plastered my face. I thought having a sleigh bed would make me dream of Christmas and jingle bells.....well you know what thought did don't you? He thought his bum was falling out of bed so he got out to push it back in again. While at work yesterday, the lady I work for had some dreadful news about her mother's health. It upset me all day. I know her mum well and didn't want to hear this. I truly had a problem trying to focus for much of the day. The journey home cheered me up. There were a couple of kids at the bus stop...boy about 12 and a girl about 14. They were loud and boisterous and I approached with a little trepidation. Pants ! I would have to wait at the bus stop with them. Just to prove me wrong they turned out to be lovely. The boy said hello to me as soon as I got there and then said he liked my hair. The girl, on hearing me reply that I liked his hair too, remarked on my accent and told me how cool it was. They then kept me amused all the time we waited for the bus. I worked with kids this age for years and usually seem to get on well with them. Maybe it says something about my mind set. Perhaps I am an old adolescent ninny who really should be old enough to know better. I don't care. After a gloomy day they were just what I needed. The picture above is where we would like to go for a few days in May. Philip and I haven't had a holiday in a number of years. He is under so much stress at work that he really needs it .......and I do too. We spent some time searching the "cheapo vacation" sites but many of the places they advertise are only available on indirect flights from Milwaukee. I really don't like having to change planes. I like to get on the plane and know when I get off I am there. So, it looked like we would have to fly from Chicago, which is an hour and a half away and a journey Philip does every day to and from work. 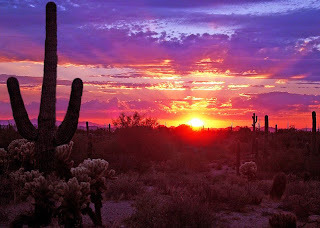 Then we found Pheonix Arizona. Oh it looks brill and it is a direct flight from Milwaukee. We are looking at The Wigwam Resort. It looks fab. Swimming pools, golf, bars.....and lots of places of interest nearby. Plus they have a special offer right now which means we could get the flights, hotel and a car for 4 nights for just $500 each. I suppose that is around 300 pounds. This seems like a good deal, particularly when you haven't been anywhere for a long time. Apparently, the temperatures generally haven't gone sky high in May (about 30C I think ). That would be perfect. I have spoken to a couple of friends who have been and they love it. I do hope it works out as every time we have tried to plan a trip before, something crops up at work. At last we ordered the bed. 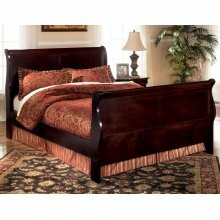 The sleigh bed in the picture. We ordered it on Saturday and it should arrive on Friday. Much as I love sleeping on the memory foam mattress, I do not like being on the floor. I know it won't feel any different but I don't like being so low down. I mean, I have reach really high to my bedside cupboard, to get my cup of tea !!!! In a moment of weakness we bought a matching chest of drawers too. The one we have is falling to bits so it needs to be put out by the roadside until someone picks it up. You could put anything out there, vacuum cleaners, toaster ovens, old undies.......and they are all gone in minutes. Sunday we went out for brekkie as usual. Philip had a "chicken fried steak".....lord knows who thought this up, but it is a southern thing. They get a steak, cover it in the sort of coating you put on southern friend chicken, and then fry it. It comes covered in "country gravy" which is pale and thick and looks disgusting. People seem to enjoy it though. Philip certainly did. Oh I was totally sensible and had an Alaskan Waffle. This waffle is covered in strawberries, ice cream and fresh cream. Yum. It was like eating dessert for brekkie.....and why not !!! We then went to the driving range where he practised his swearing at golf clubs/balls and I did some people watching. My favourite pastime when not eating waffles and ice cream. Just bimbled around the shops after that, came home and read the paper. The weather continues to be glorious. It has hit 80F quite a lot and you feel like you should be out doing 'stuff'. Trouble is there isn't much 'stuff' to do. We are generally still enveloped in snow at this time of year so nothing is up and running. No outdoor activities. Way too dubious to start any gardening as it could still change dramatically. We have had deep snow in mid April before so I never put any bedding plants out until May. My chum up the road assures me that Winter is not over and it will be back with a vengeance at the end of March. I have been asked to do a dog portrait. I am pleased. It is a lovely boxer dog with a face full of expression. I have the photos to work from and will be starting it soon. I am currently in the middle of a painting so I can switch back and forth between the two. The painting will take several weeks, even months to complete so it will be nice to do both for a change. I was brave enough to put my wolf picture on a facebook page I belong to that is all about arts and crafts. I doubt I will put another on there though. There are some amazing artists (a few rubbish ones too ) on there and I just don't feel my work is up to their standard. I felt very self conscious as soon as I had put it on there. I don't think I will do it again. A week ago we were under snow and ice. Then it all changed at the weekend and things started to warm up. At the beginning of the week it was in the 70sF, warm & sunny. We then had the most amazing thunderstorms. Severe storm warnings on the telly. Hail the size of footballs (I may have exaggerated a little there). I was expecting a tornado warning but didn't get one.........yet. Yesterday was in the upper 70s and today it looks like we hit 80F or 28C (I think). Wisconsin weather is officially mad. For the first time ever, I have seen daffodils. Maybe they have tried to grow before but are not usually visible through 4 feet of snow. The birds are all getting twitterpated. I just hope it continues now. Please, please don't let me wake up to 2 feet of snow any time soon. I finished the above picture this week too. I had started making plans for it when Alan was here. I had accumulated photos and had formulated a design in my head. Alan was excited as he loves wolves. I may use it as this year's Christmas card. I have had such positive feedback about it that I may make a collection of wolf pictures. I have been told over and over to make a facebook page with my artwork on it. I haven't so far as I wouldn't want anyone to think I am pushing stuff at them. Maybe I will just make the page and put prices on it. Then anyone who wants one can contact me. I am nervous about even doing this though. I don't have a lot of confidence in the stuff I produce but I expect everyone is like that. Tuesday one of my teeth felt funny. No not the one I have had all the trouble with. That is now elsewhere and can hurt as much as it likes. No, this didn't hurt........just felt as though it had something stuck in it. Only it didn't. On further inspection it had a lump missing from it. Pee, po, belly, bum, drawers.....here we go again. I saw the dentist yesterday. It needs a crown. I guessed that. It will cost $500.......I guessed that too. He put a temporary squirt of something in it and I will have the prep done in a couple of weeks. Finally, a bus stop story. With me in the shelter, whilst waiting for a bus to the mall, was a lady. This lady was fiddling with her mobile phone. It made a funny noise. Coming over to me she pointed at the screen and said, "Can you tell me what this says as I can't see without my glasses." I am exactly the same. I felt sorry for her. I know how lost I am without mine. "Ok," said I, and began rummaging around it my bag in search of my specs. How is it that everything you ever want out of your handbag, be it lipstick, keys, glasses, toilet chain, (another story altogether) whatever, always manages to elude you. After spending 5 minutes pulling stuff out of my bag, shoving things in my pockets and searching around the bottom of it, I found them. Took them out of the case and put them on. All this time she waited patiently for me to read the screen to her. "Oh," I said, "It just says you received a text at 11.15am." 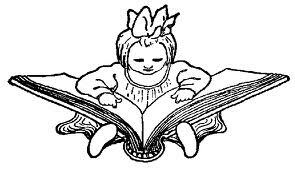 " Ok, thanks," she replied, "I just didn't want to have to look through my bag for my glasses." I like that quote. Makes me feel a lot better about stuff. I am getting excited now, looking forward to Donna and Lauren's visit. Lauren keeps sending me messages to say how much she wants to get here. That is nice. What is also nice is the fact that she adores Philip too. She even put him as her 'granddad' on facebook. He loves this. They do get on so well too. That helps. We have bought her some new bits and pieces for her room. I love the fact that we have two spare bedrooms, one of which is hers. Not just a spare room but personalised with things she has chosen herself so that it is totally 'hers'. I like the fact that she has a haven here, which must feel like home. She will miss gathering up 5 kittens to take up to bed with her this time though. Donna is even more excited because she is going to spend 4 days in Las Vegas during this trip. She is meeting up with an old friend who used to live next door to us in Ashford when they were kids. He is currently living in California and can drive to Las Vegas. He has been many times before so will be giving her an amazing guided tour. I am not jealous.............much. Las Vegas is one of my most favourite places, but I think I am more excited over Donna going and seeing it all for the first time, than if I were going again. We are hoping to have a few days away ourselves, probably in May. This will be before the kids start their summer holidays (they start at the beginning of June here) and will hopefully be a bit cheaper. I would like to go somewhere warm. We haven't had a break away for several years. I do hope we can this time. Then, Lauren, and possibly Donna will be back for the summer. Glenn is just starting a new job on Monday so he won't be able to come. He needs to build up some money and even if I paid for him to come over, he wouldn't as he likes to be able to pay his own way. He had a rotten 2011. He had two surgeries, one of which was life threatening. He was off work for ages and lost his job and he has been very depressed. He has been doing horrid agency work which was sometimes there, and sometimes not. We have all been very concerned about him but at last things seem to be looking up. I am really hoping I can get over there in September/October time. I need to see him and my friends. I really missed that trip last year. Right then back to the book. Well, that is enough said on that subject. The new bed is brill. I am really surprised at just how much I like this memory foam mallarky. Of course, ( <---- did you what I did there? That is what we call a comma. Not everyone knows about these ), it does help that it is a king size bed and is huge. Oh I have so much more room. It is delish. The strange dreams continue though. This last one seemed to go on forever. I even woke up once but when I went back to sleep, I found myself right back in it. In this one I was trying to look after a disabled couple and their daughter. It was awful. The guy could do virtually nothing for himself and I was trying to wash and dress him, feed him......oh and more...yuk. Then a friend of mine showed up to tell me the daughter had to have her appendix out and we would be the theatre nurses. Now, this is ok for her. She is a retired ICU nurse. I, on the other hand, cannot apply a plaster without it screwing up and sticking itself into a little bundle of gunk. I would be ok if you just needed someone to hand you an aspirin and to tell you it would be better in the morning, but a theatre nurse !!!!! It looked like I was going to get out of it when the surgeon didn't arrive. I was just getting my coat on and heading for the door when three surgeons showed up and the poor, bloody patient was wheeled in. They kept asking me to do medical stuff. Had I bleached the patient? Yeah, that is what one said. I was looking around for a tub of Ajax or a bottle of Domestos but there wasn't any. Then they started getting out syringes and drips. I had no clue what to do with any of it and my friend was absolutely no help at all. Things were not looking good for the poor girl. They had just started wielding scalpels, when I woke up. I was so relieved that I woke up. I couldn't allow myself to go back to sleep in case they were still there, stitching her up by running her under the sewing machine or something. If anyone has any ideas I would love to know. "Timmy, having found a pimple on his bum decided to stand up." 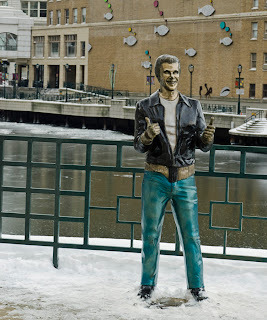 This is a picture of a statue of Fonzie which is in downtown Milwaukee. 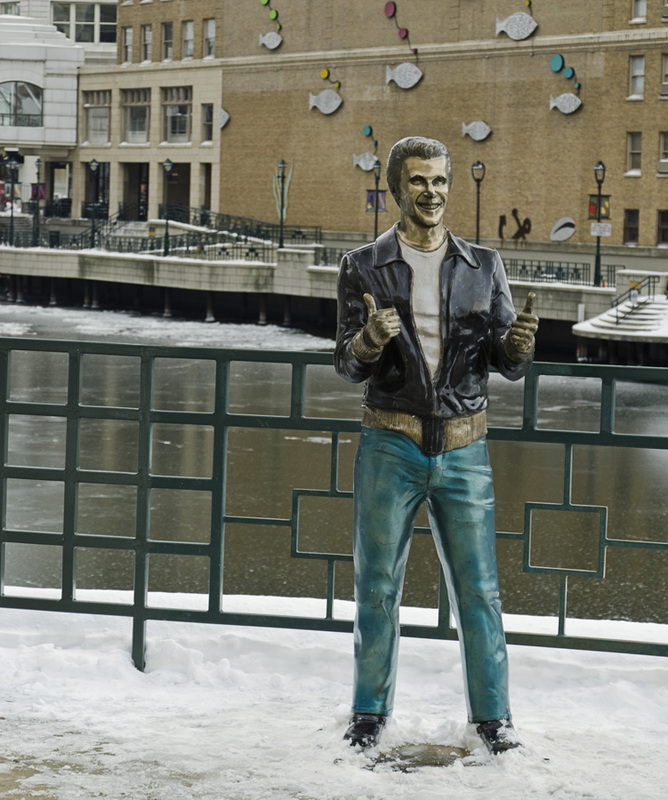 In case you didn't know it, Happy Days was set in Milwaukee. I only put it here as I think it is an excellent piece of art/sculpture. Dilemma :- Philip has a friend ( I know him too) at work who has written a book. He has had it published. I thought it was published by a company but apparently you can sort of publish a book yourself, at your own cost. I really don't know how it all works but anyway, he has asked me to read it. He has also asked me to give a review of it on Amazon. This is where I find myself in a dilemma. I don't mean, what if I hate it. Just, what if I don't like it? How am I going to review it? You see, even if it is a friend, I cannot bring myself to give false praise. I will not tell someone the work they have produced is brilliant if I think it isn't. I will praise stuff that I do think is good. I am only too keen to give praise to someone with talent. What happens is that friends tell each other that they are wonderful at something simply because they are friends. What if this book isn't any good? If I were to tell him it is really great, then he will expect to be able to sell it and will be so disappointed when it turns out only his friends buy it.........and they are only buying it because they are his friends. I have a friend who makes amazing greeting cards. She really is talented and the cards are so original and pretty. I am always telling her how clever she is. I know another guy who has started tattooing. He does wonderful artwork and should do it professionally, in my opinion, although I know it is very difficult to get into. I also tell him how impressive his work is whenever I see it. Another friend does beautiful tie-dying and makes cute coats for dogs. I love them...and say so. My father in law produces beautiful abstract artwork. I have one of his paintings on my wall. But, in the same vein, I cannot hurt someone's feelings by criticizing what they have done. If this book turns out to be pants, I would not be able to tell him so. I shall do what I always do. I shall do what Thumper's dad taught him. "If you can't say nuthin' nice, then don't say nuthin' at all." I have found this to be the safest option and do use it when I have to. I shall do a review on Amazon........although I would prefer not to..............but I shall choose my words very carefully. I would not want to upset him. Who knows? I may be worrying about nothing. It might be an amazing epic that I shall rave about. Poor old Bubba needed to have a dental done. He had to be at the new vet's at 7am. Having fasted from the night before, due to having an anesthetic, he was not happy when he left. I have to admit I was worried about him. He will be 14 years old this year and I was concerned he might not wake up. The vet's office phoned around 9am to say they had to take 3 teeth out. OK....what else can you say. They then phoned back about 10 minutes later to say they had to take out another 2. Lollipop had disappeared as soon as Philip got the carrier out to take him. She was the one having teeth out before and she wasn't having any more of that old nonsense. At around 1pm we were told we could go and get him. I couln't get there quick enough. We were in the reception area and told the vet's assistant we were there to collect Bubba. There was a door leading from this room which was open. As soon as we spoke to her there came this heart rending wailing from the next room. Oh this was deep, mournful moans. "Oh", she said, " He has heard you". It was such a plaintive sound that it broke my heart. To think he recognised our voices was amazing. But, then I suppose, in this world of American accents, we must stand out a bit. He had had plenty of pain meds and we have more to give him. His mouth is stitched up and must be very sore. But, he will eventually be much more comfortable than he was. Cats are funny things. Far more complicated than dogs. While he was away, the girls really missed him. They couldn't settle at all. When he came back...........they all hated him because he smelled of the vet's. Apart from Tootsie (the baby) they all hissed at him and wouldn't get near him. Lollipop was the worst. She didn't just hate him she hated everybody. You would think they could just see it was him but with cats it all depends on scent. Today, Thursday, is the first day Lollipop has stopped hissing at him. She is still hissing at Tootsie as it seems it was all her fault. Whilst waiting at the bus stop (you knew this was coming didn't you), an elderly man approached. Oh, please don't start speaking to me, my mind raced frantically. "Good morning," he said, " How are you today?" Pants, this is how it always starts. I answered him and then he continued. He told me what time he thought the bus would be there and when I answered him it became apparent that he was deaf. Now I had a choice. I could either yell pathetic answers to him at the top of my voice, convincing all and sundry that I was a nutter, or I could just smile sweetly and nod my head. It was at this point that I realised he actually wasn't one of my usual bus stop idiots, but a lovely old guy who wanted someone to talk to. He told me about his childhood. How he liked to be outside. He had known his great grandparents who died in the nineties. His father had died when he was 16. He had worked at first in a factory but decided he was getting anywhere and trained to be a baker, which he loved. He will be having his 50th wedding anniversary this year. He is 85 and has 5 children. 3 girls and 2 boys, plus various grand children. He used to be better looking and had blonde hair when he was young. All this time, I smiled and nodded. I did try to answer a couple of times but it was a bit useless really as he couldn't hear me. When the bus came he told me it was nice meeting me. I can't think why as I had said very little. I told him it was lovely to meet him too. It makes me feel better about the fact that I do respond politely when people talk to me. Some of my friends tell me not to answer as it only encourages the nutters. This may be true but if it means that just now and again I hear stories from a very sweet old guy, then it is worth all the others with their "crabs which are leaking" or the " it's a train watch...it goes WOO WOO".